This is the second movie in the Millennium Trilogy, the first being The Girl With the Dragon Tattoo. Word to the wise; if you have not seen the first movie, I'd strongly suggest going right now and renting or buying it to watch for two reasons. Reason 1: It's a damn brilliant movie filled with action, suspense, thrills and a gripping story with a heck of an ending. Reason 2: If you don't go and watch that movie right now before this one, I do think you are going to have a lot of trouble getting into it as most of the character development took place in "Dragon" and you will have a mediocre movie experience at best. OK, now that you have watched the first movie and have an appreciation for the actors, storyline etc we can continue with this review with a degree more efficiency. Firstly this is a non English speaking film so once again, if you are a Neanderthal who cannot cope with subtitles, this is not the film for you. The audio in this movie is Swedish with English subtitles. The story continues the tale of the enigmatic Lisbeth Salander, played with utmost skill by the wonderful Noomi Rapace, a hacker with one horrific childhood who has been framed for three murders that have taken place to cover up a web of deceit and prostitution involving people from high level walks of life. Now she and journalist Mikael Blomkvist must unravel the mystery as to who would want to do this to Lisbeth and why. This is a fast paced film that still manages to tell the ongoing story of Lisbeth with nods to her troubled past, whilst dealing with the present predicament she finds herself in. It's an intelligent script filled with characters that you want to know more about and cheer on, even when they might not be doing exactly the right thing. Lisbeth in particular displays fits of violence on more than one occasion, but the audience sympathises and even applauds some of her acts of retribution. I don't think that we would have done so under a less accomplished actor than Rapace. I do think the film does not shine quite the way that The Girl with the Dragon Tattoo did, and that has more to do with the way the story panned out and we got to know the characters to a far greater extent than Played with Fire allows the viewer. Dragon fed us information us the characters learned it, thus enabling the audience to feel as though we were uncovering the mystery at the same time as Lisbeth and Mikael did. The Girl Who Played with Fire does not give us those moments at all during the story and I do feel that we are left a little the emptier for it. That minor complaint aside, this is a worthy successor to the first film and makes me look forward to the next installment which I believe to be just around the corner. It's one heck of a ride that will make you uncomfortable at times, horrify you at others but will not let you down in terms of a strong story with excellent portrayals by actors who have gripped their roles with a passion. Video on The Girl Who Played with Fire….. somewhat disappointing to be honest, especially for a blu ray release. Heavy grain permeated the screen the entire movie. At first I thought it was a deliberate effect but as the movie wore on I realised that it was a somewhat disappointing transfer that was behind this. I am certainly no movie technician by any means, so I will confess that I have no idea what the movie was originally shot on but it did amaze me that a new release could have this much grain in it. It is consistent, but had an effect on colour and detail at some points. This is nitpicking, however I'd expect more from a blu ray release. Shadow detail is good when black levels are also well defined. Audio is another standard affair with a Swedish language 5.1 mix and English subtitles. Personally I prefer hearing a movie in the language it was filmed, however I have read online that other parts of the globe were offered English language dubs that might have made this movie more accessible to our less literate peers. The audio is a clear mix, and at no stage did I have any problems making out conversation, even whispered ones were intelligible and easy to understand. The movie does make scant use of the rear channels which did surprise me, as that could have served to drag us more into the world of Lisbeth. The musical score is good and certainly does it's part in the film to heighten scenes and tension. On a lighter note, the song that loops on the menu page of the film was certainly a downer with lyrics repeatedly asked who is going to die for me? Extras on this disc are an utter farce sadly. There are two trailers and some poor resolution stills to navigate through. I do think that they could have gone to more effort to get some commentaries, interviews and other making of materials ready for this release. It simply didn't make sense with a movie that has this pedigree to not give fans some insight into the creative process and it was truly an opportunity wasted. Another thing to note is that on the jacket for this disc, there is an image of Lisbeth casually leaning against a convertible that is ablaze. It's a damn cool image, but doesn't even happen in the film. Why bother putting it on the cover making it appear like it's a scene? I don't get that. 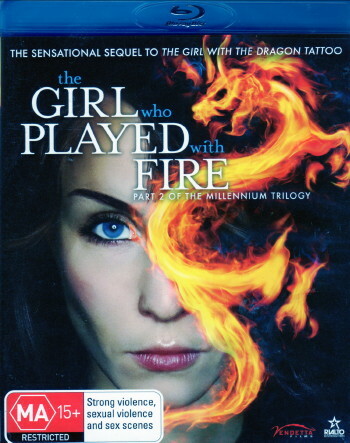 The Girl Who Played with Fire is an awesome movie and this is a nice enough quality release that is well worth the purchase for the story alone. An edition with extras would have been nicer and I hope that at some stage down the track they see the error of their ways and give punters more of a look at how the film was put together. Highly enjoyable and certainly rewatchable, this movie is a good addition to your collection.